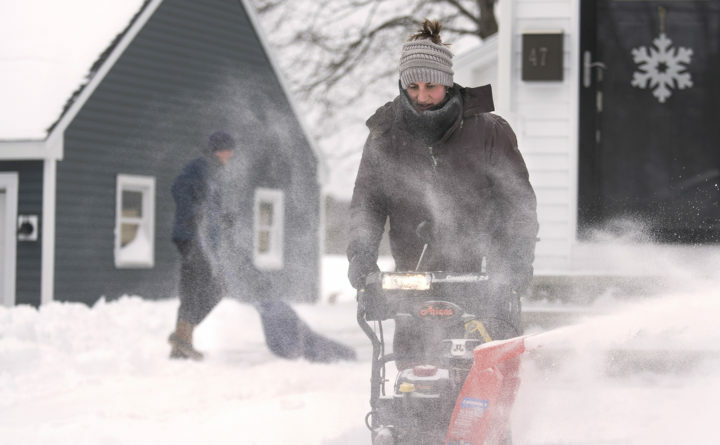 Sarah Estes, right, and her fiancee Adam Clark clean up the snow from the driveway of their Bangor home, Jan. 21, 2019. A winter storm will dump a fresh batch of snow over most of Maine Tuesday night into Wednesday before a blast of arctic air arrives Thursday. The National Weather Service has placed much of southern, central and western Maine under a winter storm warning, while a winter weather advisory is in effect along the coast and eastern Maine into The County. Greater Bangor is forecast to see about 7 inches of fresh snow, with similar amounts falling from Millinocket to Caribou and points north, according to the weather service office in Caribou. The storm will bring lighter amounts along the Down East coast from Bar Harbor to Eastport, where only 2 to 3 inches is expected. That snowfall will begin over Greater Bangor about 9 p.m., with it getting a later start elsewhere in eastern Maine and The County, where the snow will start to fly early Wednesday morning, according to the weather service. Higher amounts are expected to fall over the western mountains and Piscataquis County, where Greenville could see 10 inches by sunup Wednesday. Close to a foot could fall over an area extending from Fryeburg in Oxford County to Jackman in Somerset County, according to the weather service office in Gray. Over southern Maine, where snowfall is expected to begin Tuesday evening, anywhere from 4 to 8 inches is forecast from Portland to Belfast along the coast and inland from Lewiston to Skowhegan, according to weather service. Along the coast the snow is expected to change to freezing rain early Wednesday morning, according to CBS affiliate WGME. While the snow will move out of the state by Wednesday morning, a blast of icy air will come on its heel, sending Thursday’s high temperatures plunging into the single digits for much of the state, according to the weather service.